Why do situations and people upset us again and again? Why is our self-esteem fine one moment and in the next we are filled with feelings of inadequacy? What can we do to decrease frustration and stress? How can we create better relationships and experience more joy and fulfillment in our lives? For the past three decades, my primary focus has been seeking answers to these questions, applying what I discovered, and sharing it with others. In my first book, The Yes-I-Can Guide to Mastering Real Estate (Random House), I focused on teaching how to create wealth through real estate investment. I was gratified by the response I received from readers who felt it gave them the information they needed about successful investment in real estate, but I felt I had more to offer to help people achieve their goals, both personal and professional. Over the years I mentored many people, and the common thread I found was that I was helping them overcome emotional barriers to taking action so they could accomplish what they want out of life. I wanted to share the lessons I learned about the psychology of achieving goals and also the biggest lesson I learned: that genuine success isn’t just financial; it’s learning to create a fulfilling life for ourselves. This led to my writing My Mind Is Not Always My Friend: A Guide for How to Not Get in Your Own Way (Fresh River, 2010) and Your Mind Is What Your Brain Does for a Living: Learn How to Make It Work for You (Greenleaf Press, 2013), both coauthored with Mark Bruce Rosin, and now to my writing this book, Insights for a Happier Life—One Moment at a Time. The phrase one moment at a time is vital to the insights I’m sharing because, as I’ve learned and as you’ll see throughout this book, we create our lives one moment at a time, and every moment gives us an opportunity to create a new life experience. We are reaction machines; we don’t always have a choice about what happens to us, but we do have a choice about how we will react to it. No matter how we have reacted in the past, each new moment provides us the chance to let go of our old past-based thinking and react in new, more productive ways. If we continue to think, act, and react in the same ways we always have, we will continue to feel exactly as we always have. But it doesn’t have to be like that—we can learn to change. This is the subject of this book. 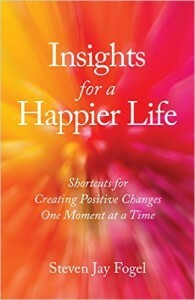 It’s based on my most popular blogs, especially those that people have found the most helpful, and my goal is for each chapter to offer insights that you can apply moment to moment and long term in order to support you in reducing stress and frustration and experiencing greater happiness.